WANTED: Fertilized Black Australorpe chicken eggs to hatch. 707-834-0555. TriCities. DOCTOR POWER drag screen attachment, new, 60", $80; 1975 Ford LGT 145 tractor, with snow shovel attachment, best offer; Yard King performance 25 hp/ 52" cut riding lawn mower, best offer. 509-778-3320. BntnCity. GRASS FEEDER hay, $200/ ton, 22 bales/ ton. 509-948-0806. Kennewick. BLACK WALNUTS, washed & clean, cracked, $4/ lb, uncracked, $3/ lb, plus shipping. 541-564-9273. Hermiston. 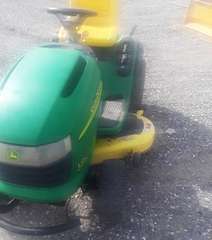 JOHN DEERE riding mower, Model L120, with bagger, runs great. $750. 509-539-8599. TriCities. GRANNY SMITH apple trees, $3.50 each, 800 available; Massey Ferguson 265 tractor, motor, trans & tires good, $1500. 509-961-7064. FOR SALE: IHC dump rake, $125; 4' bow gate, new, $200; 10' gate, $100. 541-571-6674. Irrigon. TWO 1/4 mile 40'x4" sprinkler pipe, with automatic levelers, & sprinkler heads, & wheel movers, all disassembled & stacked; 100 sprinkler pipes, 40'x3", with risers, & sprinkler heads; John Deere 3010 tractor, with duals; John Deere 620 tractor; John Deere model B tractor; New Holland model 1030 harrow bed; New Holland 283 baler; John Deere 830 swather; Eversman disc; John Deere roller harrow; Heavy duty 3 point blade; Two 500 gal fuel tanks; CanAm axle trailer; 55 gal 3 pt sprayer. Any reasonable offer. 509-961-8206. Toppenish.